She’s talking about the Billie Eilish Experience, an immersive activation created in collaboration with Spotify that brings her debut album, When We All Fall Asleep, Where Do We Go?, to life. Inside, each of the album’s 14 tracks is translated into a multi-sensory moment for fans to experience room by room. The whole thing is quintessential Billie: fun, creative, and very, very trippy. “I wanted everybody to see the album through my eyes,” Billie said of the Experience, which launched in downtown Los Angeles on Thursday and is open to the public for one weekend only. It was inspired, she explained, by her synesthesia: a neurological condition that basically means every song she writes has associating colors, textures, scents, shapes, and feelings attached to it. Each room has a handy guide on the door that breaks all of those elements down, giving you an idea of what you’re in for. 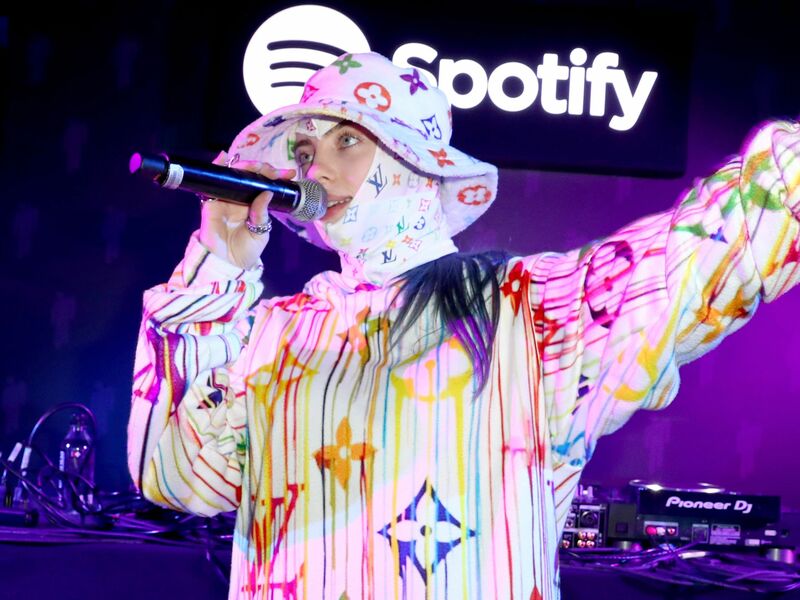 If you’re not one of the lucky few who’ll get to see the Billie Eilish Experience in person, fear not! We’ve broken the whole thing down, room by room, so you can feel like you were there. I’m only sorry you won’t get to pet the puppies inside room No. 8… but we’ll get to that in a minute. How do you devote an entire room to a 14-second introduction about Invisalign, you ask? Simple: The Experience began in a small room where guests check their bags by putting them on a conveyor belt that rolls inside Billie’s open mouth. Creative and practical! This thumping, bass-heavy banger comes to life via a “cookie dough and vegan milk race course,” which is about as hilarious as it sounds. Each guest gets a red toy car and a remote that they use to drive their mini whip around a track that actually looks like a river of (soy) milk surrounded by chocolate chip cookie hills. That photo above has zero filter or editing to it — this sparse room was hazy, cold, and super disorienting, not unlike the song itself. First thing’s first: Unlike this track’s accompanying video, there were no real spiders inside this room. (Phew!) There were large screens projecting footage of tarantulas crawling around, but the real highlight was the actual crown that Billie wore in the vid, which was displayed in a glass case at the back of the room. But beware, arachnophobes — you have to make it past the spider screens to get there. This room had maybe the most literal interpretation — its four walls projected giant flames, while heaters underneath the metal grated floor made you not want to stand in one place for too long. It was toasty in there! This lime green room reeked of “teen boy cologne,” as our guide put it, which is really the perfect scent for a song all about crushing hard on someone. Inside were cutouts of Billie’s custom Blohsh motifs, and guests were encouraged to square up to one of the signature shapes to find their perfect fit. In an Experience full of Instagram-friendly moments, this was one of the best. This room was basically one giant foam pit (each piece of blue foam was shaped like the Blohsh character) that you fall backwards into off of a platform. There’s a camera hanging from the ceiling, and it captures your (probably not-so-graceful) fall in a handy, Insta-ready GIF. One word: PUPPIES!!! A dozen or so furry friends wander around this all-purple room, and it’s a miracle if you can make it out of there without smuggling one into your purse (not that I tried or anything…). Most of them are shepherd mixes, and there are also a couple sweet pups with only two hind legs. Bonus: they’re all adoptable! This quirky, Office-sampling track comes alive in the crafts room of your dreams. There are eight tables set up with a myriad of arts supplies: stickers, markers, pipe cleaners, feathers, glitter, and everything else you need to bring whatever wacky piece of art you want to life. The stranger, the better, of course. The sign on the outside of this room described the feel of it as “very creepy, like you don’t even want to go inside.” That definitely rang true as soon as you stepped in and saw the large white bed that guests are encouraged to crawl under. Indeed, once you slither through, you emerge in a pitch-black room with glow-in-the-dark symbols (like spiderwebs) and phrases (like the album title) drawn on the walls. Chilling stuff! This was probably the tamest of the 14 rooms, which makes sense, considering it’s for a track inspired by a very cute video game. It basically felt like stepping inside a giant aquarium; fish swam across the screens, a bubble machine was cranked all the way up, and it smelled like plastic toys. As our guide explained, Billie wanted this room to feel dim, muted, and heavenly; evoking the feeling of when you’re on an airplane and you get the itch to go sit on the fluffy clouds you see outside your window. The room did, in fact, feel like a big cozy cloud; the floor was covered with white pillows, and the walls projected a gorgeous pastel sunset. If you’ve ever wanted to step inside Billie’s bedroom, this is probably as close as you’re going to get. Her bedroom at home is covered with personal thoughts and lyrics, our guide explained, and the red-lit room for “i love you” flips that idea by letting fans write messages to Billie on a tablet about how she’s inspired them. The Experience ends on a sweet, no-frills note, with a short maze that you walk through to get to the end. It’s effective in its simplicity, and it also keeps the focus on the song itself, which I had to ask Billie about once the Experience was over.